I love curated movie lists… I love reading them and I love creating them. However, I have always steered clear of ranking Pixar movies. Why? Well largely because it is so hard to pick favourites. Following the release of Incredibles 2, I decided to be brave and order my top ten favourite Pixar movies. Perhaps I will change my mind tomorrow, next week or in the months to follow. So, let’s just go for it shall we? Oh and do let me know what you think in the comments section at the end. This placement of Pete Docter and Bob Peterson’s brilliant film about 78 year old Carl Fredricksen (wonderfully voiced by Edward Asner) and his adventures with young stowaway, Russell, may well be controversial. Don’t get me wrong, I love Up. Well, I love the beginning of Up. The famous montage about Carl’s marriage to Ellie destroys me every time (I'm feeling all emosh just thinking about it). I am just slightly less enamoured with Christopher Plummer’s Charles Muntz and his pack of talking dogs. Coco is a film about memory, grief and finding your place in the world. It is about life and loss, remembrance and death. Pretty heavy themes for a family animation. However, this is a movie from the animation studio that brought us Inside Out. And so we can relax, safe in Pixar's capable hands. Director Lee Unkrich’s film is a visually stunning, consistently funny adventure. A race against time with gripping twists and turns and a final ten minutes that packs a real emotional punch (excuse me, there’s something in my eye... again). Inside Out is a stunning, moving and wonderfully creative movie. The film, directed by Pete Docter and Ronnie Del Carmen, was a real return to form for Pixar and works on so many levels. Younger audiences love it for the endearing, brightly coloured characters while older viewers appreciate the film's deeper message about the importance of emotional balance and why sadness is not always to be avoided. I love Pete Docter and David Silverman’s Monsters Inc. It makes me laugh, it makes me cry and, in my book, this film has one of the best movie endings in cinema history. The story is simple but brilliant and the pairing of John Goodman (as Sully) and Billy Crystal (as Mike) is an absolute joy. The Incredibles gave us a superhero family that we could really care about - I love Bob, Helen, Violet, Dash and Jack Jack. Brad Bird’s movie also asked us to consider the collateral damage caused by superheroes - long before Iron Man got spooked. One for the whole family that just gets better with every watch. The Incredibles franchise has a nice ring to it, don't you think? In 2007, Brad Bird and Jan Pinkava set out to show us the emotional power of taste. Not an easy task and one made even more challenging by having a rat as a chef. However, Ratatouille overcomes all obstacles. This is a wonderful animated classic that I could watch again and again (and frequently do). Pixar's Toy Story series comprises three (soon to be four) entertaining and action packed adventures featuring a host of endearing characters. However, these films also explore themes of humanity and mortality. Toy Story 2 is a wonderful movie and earns its place on this list just for introducing us to Jessie the Yodeling Cowgirl (brilliantly voiced by Joan Cusack). Watch out for yet another heartbreaking montage... darn you Pixar! Many of Pixar’s films feel timeless - none more so, perhaps, than Finding Nemo. This beautiful tale examines a truly poignant theme - a theme the animation studio explores time and again: the need for parents to let go and allow their children to make their own way in the world (sob). The animation in Finding Nemo is stunning, the story compelling and, largely thanks to superb vocal performances from Ellen DeGeneres (as Dory) and Albert Brooks (as Marlin), Andrew Stanton and Lee Unkrich’s film is hilarious from start to finish. The animation that stunned the world, Toy Story is an absolute classic film with a story that has delighted young and old alike since its release in 1995. Featuring an incredible ensemble voice cast, Toy Story is a funny, gripping and moving tale of friendship and a reminder that there is more than enough love to go around. My love for Wall.E truly knows no bounds. Andrew Stanton’s insightful and utterly beautiful film calls on the silent movies of the past to warn us of the potential dangers in our future. More than anything, Wall.E is a gorgeous romance between a lovable waste collecting robot and a Extraterrestrial Vegetation Evaluator - a bot we come to know as Eve. Wonderful. What do you think of my list? 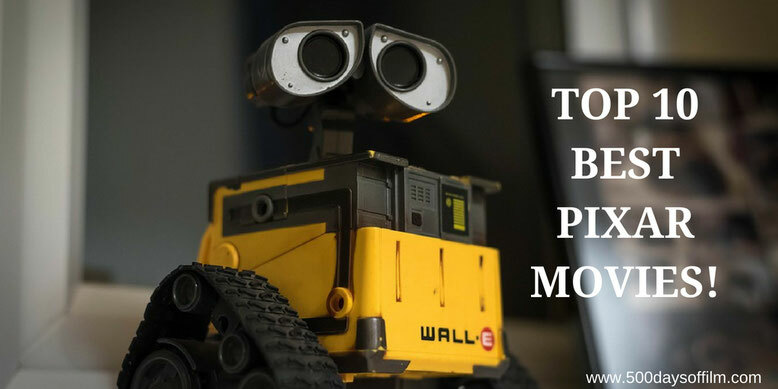 What are your top ten favourite Pixar movies? Let me know in the comments section below or over on Twitter. You can find me @500DaysOfFilm. My only real beef is that Toy Story 3 is missing. Otherwise, you got the most important part right - no Cars movies.